I wake up feeling ready to take full advantage of my last day in Austin, which starts with another breakfast with those delicious waffles in the hostel kitchen! I see that the front desk cashier has a VISTA pin on her lanyard, so I ask if she’s serving in the program. She says no, then asks if I am. When I say yes, I ask if there’s a discount for current VISTA members. She says no, but then cheerfully points to the pin and says “I got your back though!” which really makes no sense to me at all. The museum exhibits are located on several floors, so we start at the main floor and work our way up. There’s all the normal exhibits you’d expect from a museum about someone: important life events, background, current national and world events that happened during their lifetime, their hobbies, etc. Then we start getting to the information about his presidency, which includes letters to and from various people, and recorded phone calls (between him and people like constituents, politicians, Former First Lady Mrs. Kennedy, MLK Jr, and others). 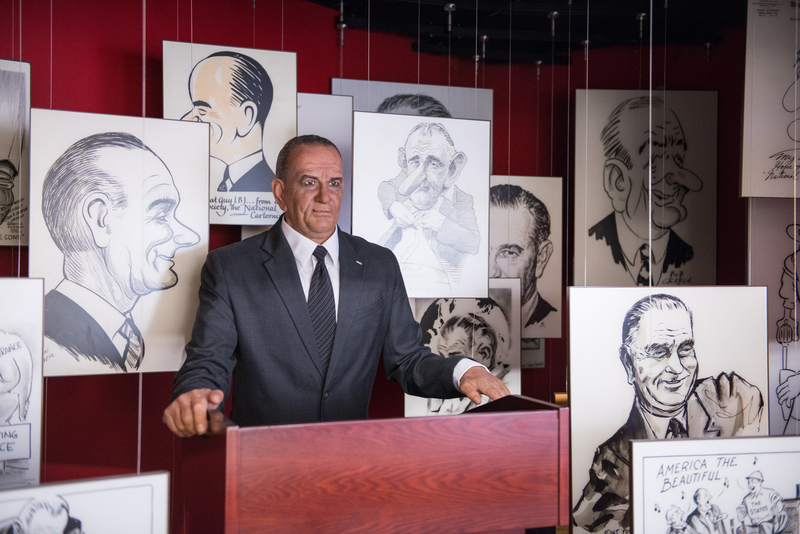 There’s also an animatronic LBJ statue that moved as it tells you jokes and funny stories that are recordings of stories he actually told. While I’m watching the statue tell me stories (and trying not to be distracted by a very noisy, robotic sound every time he blinks his eyes), we start hearing a noise like an air raid siren, but B. and I don’t think anything of it, because there’s noise all over the exhibit from the recordings, videos, etc. That is, we don’t think anything of it until a guard walks through clearing the building and asking everyone to leave, in a very firm and urgent voice. We are directed through the gift shop on the way out, which everyone makes a joke about (even in an emergency they direct you through the gift shop!). It’s totally ridiculous because we pass by the front doors on the way to the gift shop, they’re able to open from the inside in cases of emergency, and they could have allowed a faster exit, but the guard still routes us the other way. Oh well. No one tells us what’s going on, but they do eventually move us all from the area outside the museum to the neighboring building. After five or ten minutes, a guard comes and tells us we can come back inside. I overhear an employee ask him what happened, and he gives a vague answer about it being a security alarm, and they had thought there was some sort of threat inside the building, but it’s resolved now. 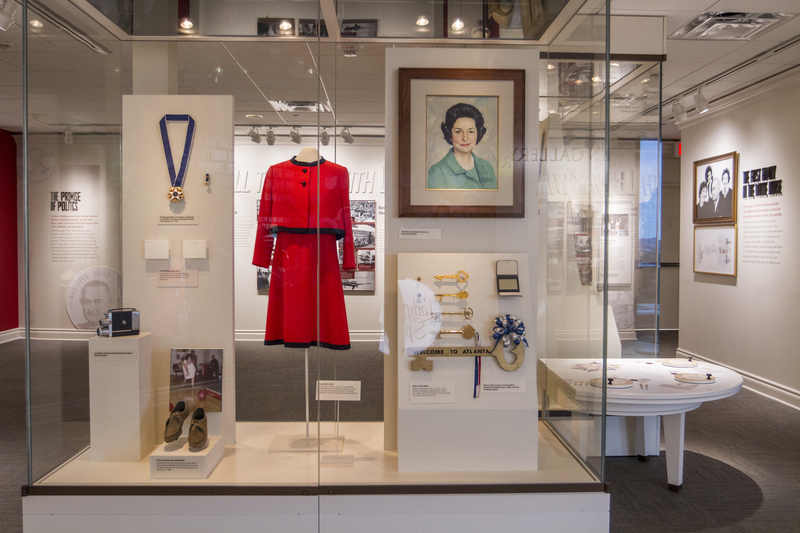 We return to the museum and learn more about LBJ’s presidency and life in the White House, as well as the lives of his family members, like his wife, “Lady Bird” Johnson. There are many things to read, listen to, watch, etc and we start getting tired after a while, so the length of time we spend on each floor gets shorter and shorter, but it’s mostly very interesting and overall a really good museum. Before heading to the next stop, I try a food called kolache, which was invented by Czech immigrants to Texas. (B. had purchased a bunch and brought it with him so I could try, since I’ve been telling him I want to eat Austin food.) It’s like a pig in a blanket, with a slightly fluffy pastry wrapped around what tastes like breakfast sausage. I love the pastry, which is a little sweet, airy, and buttery without being too greasy. The kolache makes a good snack, with a mix of savory and salty tastes that isn’t too heavy, but it’s not an amazing-to-die-for food like some people rave about it. Our next stop is the Capitol building for the basic 30 min tour. The information is very interesting, and we learn that the building is the largest Capitol building in the USA (by square footage), and while taller than US White House, it’s not tallest capitol in the nation. There are many special features like chandeliers that have the word “TEXAS” surrounding a star, doorknobs that say “Texas” with a star, and certain door hinges that say “Texas Capitol” with a star (are you seeing a theme?). The door hinges are huge (they have to be, they’re on on huge doors), and each hinge weighs 7.5 pounds! 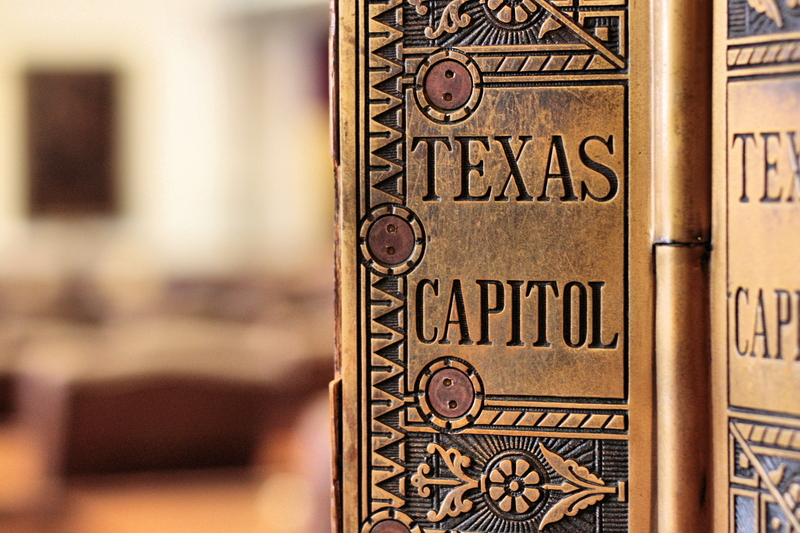 **Good to know: The Texas Capitol also has free specialty themed tours that seem really interesting, but these are only offered during certain times of the year and at certain times of day, so if you’re interested, definitely plan ahead. In addition to the regular tour, today the specialty tours include Women in Texas History and the Heroes of the Texas Revolution. Other specialty tours throughout the year include the Rest in Peace tour (haunted ghost stories, in October), The Bravest of the Brave: Celebrating Texas Veterans tour (Texas veteran contributions from Texas Revolution to Iraq, in November), and a holiday tour (architecture that inspired holiday decorations of the Capitol, plus learn about holiday traditions of cultural groups in Texas, in December). There’s also an art tour available on request. You can find more information about available times and current themed tours on the Texas Capitol website. Before we leave the Capitol grounds, we look around at some of the statues we couldn’t see in the dark on the first night, and then head to H-E-B (local grocery store) for gifts. This is definitely my recommendation for Texas souvenirs at affordable prices if you’re looking for food gifts that are really “Texas.” The company started over 100 years ago in Texas, and is now the largest privately owned company in the state (they have over 76,000 employees and more than 340 stores in Texas and Mexico). For lunch (and my last stop in Austin before the airport) we go to Javi’s Best of Tex Mex, and B. asks the waitress what makes a food Tex-Mex vs. Mexican. She tells us it’s “the type of food, like tacos, burritos, and things like that, more than Mexican dishes like mole.” B. gets nachos and I get fish tacos which comes in flour tortillas. The food tastes good, but it still seems like B. wonders why I’ve been so insistent on eating Tex-Mex this whole trip (Tex-Mex! as in Texas! I know it’s not generally thought of as great food, but it’s fun to eat something Texan while in Texas). 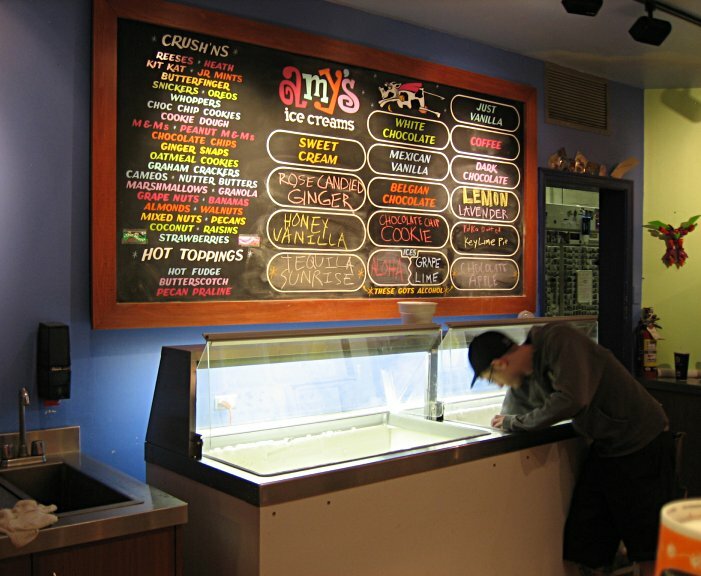 Over the past four days, I’ve received multiple recommendations to try Amy’s Ice Creams, so I want to stop there before leaving, but we’re too full to go right after lunch. As it turns out, there’s a location in the airport, so after B. drops me off, I wait in the security line, find my gate, and I finally feel ready for dessert. I tell the the person at the counter it’s my first time trying this ice cream shop and ask what she likes best. She replies that the Mexican Vanilla ice cream is “what we’re known for,” and describes it as a “more intense vanilla.” Because I don’t feel like plain vanilla ice cream, no matter how intense it’s supposed to be, I order the smallest scoop of Oreo flavor (made of Mexican Vanilla as the base, with Oreos crumbled into it). It’s very rich and thick, but the flavor is more cake batter than vanilla, so I’m a little disappointed. Still, I’ve made the most of my time in Austin, even using my airport time to continue the experience. It’s been a busy (but fun!) trip and I’m definitely ready for some rest at home! Did you like this post? Sign up now to get more travel stories, bucket list experiences, and interviews! This entry was posted in Reviews, Travel and tagged Austin, Capitol, food, kolache, museum, Texas, things to do, travel on April 22, 2016 by Shelly Najjar.